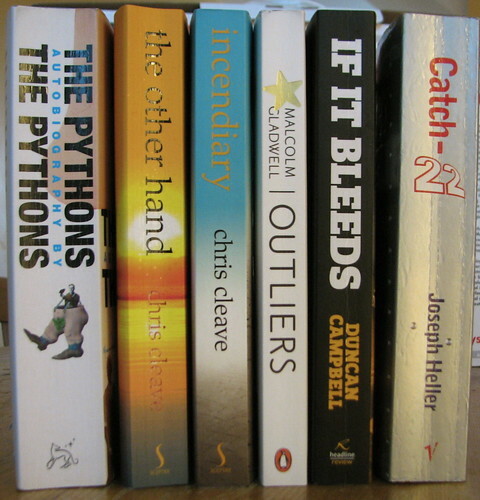 The Pythons’ Autobiography By The Pythons, Monty Python and Bob McCabe – pulled together by McCabe with care and loving attention to detail. Wonderful to see the personalities revealed via the history, the disagreements and differing perspectives. A rare thing: a top notch autobiography. The Other Hand, Chris Cleave – the first book I’ve read for a while which I didn’t want to put down. I was instantly hooked (although not, I should mention, but the rather vomitous introduction by the editor) and wanted to eat it all in one go. I then lent it to my wife, who also, one she’d started, read it one day and had to finish it before she went to sleep. ‘Page turner’ isn’t the right term for it, but it begs to be finished and the characters are fascinating, three-dimensional and ambiguous as they get. Incendiary, Chris Cleave – While it doesn’t quite match The Other Hand, it’s still an intriguing read which makes some interesting (if sometimes blunt) political points. Not quite a post-9/11 Nineteen Eighty-Four, but worth picking up. I will be keeping an eye out for more stuff by Cleave. I hope he gets some film deals too. If it Bleeds, Duncan Campbell – Double meh. Laboured in so many ways. 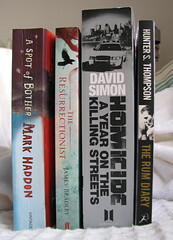 If you like good crime fiction you’ll probably want to avoid it. I wondered, more than once, how many times Campbell was going to use the is-that-my-heart-oh-no-it’s-just-my-mobile-phone-going-off thing. Catch-22, Joseph Heller – Yay, yay and twice yay. I’d forgotten how good Heller is, at his best. This is it. The Autograph Man, Zadie Smith – easily the best and least irritating Zadie Smith book ever. Hated White Teeth? Try this one. 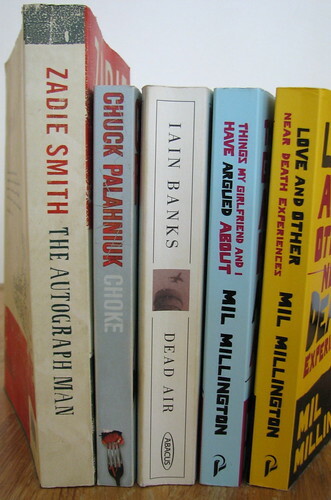 Choke, Chuck Palahniuk – dark, disturbing and funny in that way that Chuck Palahniuk (and, in their own way, Irvine Welsh and Iain Banks) can sometimes be. Dead Air, Iain Banks – reread it again, mainly for the very-tense-can’t-possibly-put-it-down bit about 2/3 through. You know, when he’s got to do that thing wearing the gloves. Brilliant! Things My Girlfriend and I Have Argued About, Mil Millington – Very very funny book. You should read it. (Apparently I last did so in December 2007 and it was a pleasure to do so again.) You should really also read his searingly funny website which pre-dates the book. The Beach, Alex Garland – better each time I read it. And so much better than the film. Remarkable first novel. Richter 10, Arthur C. Clarke & Mike McQuay – pappy. Clarke came up with the idea and the story in 3 pages. McQuay did all the heavy lifting. 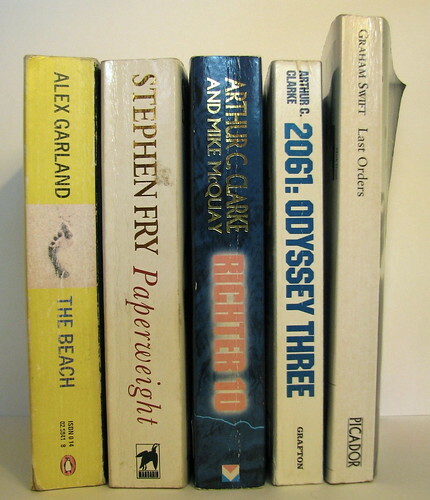 2061: Odyssey Three, Arthur C. Clarke – instantly forgettable. To Your Scattered Bodies Go, Philip José Farmer – passable sci-fi. Apparently it’s the first in the ‘Riverworld’ series, but I don’t think I’ll be bothering to find the rest. Hermann Göring is the one-dimensional bad guy? That’s pretty lazy. The White Tiger, Aravind Adiga – this is brilliant. 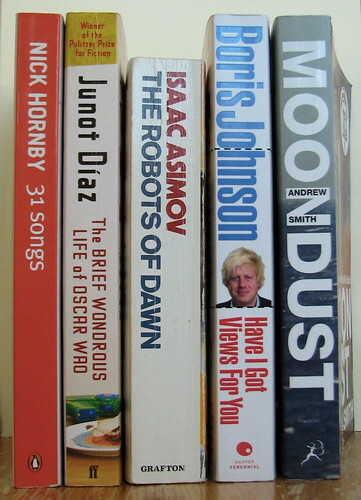 Man Booker Prize winner, 2008. It’s everything ‘Slumdog Millionaire’ should have been. 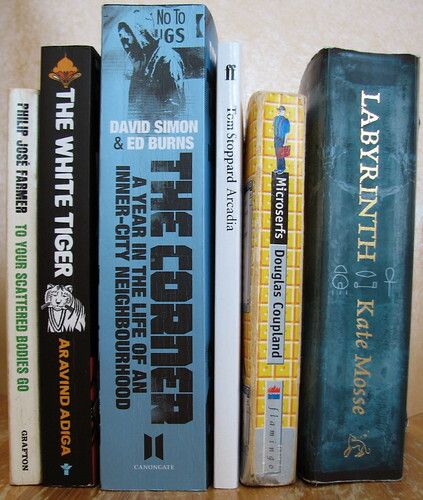 The Corner, David Simon and Ed Burns – it’s like The Wire in condensed, dead-tree form. Brilliant. Microserfs, Douglas Coupland – I’ve lost count of how many times I’ve read this. Every time I do, I get a little bit more annoyed about the writing (caricatures of geeks, clunky ethnography, twee unsubtle affected nonsense throughout) but I do cry a little bit harder at page 369. Labyrinth, Kate Mosse – I don’t really know where to start here. I’ve been describing it as “Dan Brown for girls” and honestly, it’s dreadful. Often whole pages go by before you’ll see an adverb or an adjective while similes and metaphors appear to be rationed at about one per chapter. It’s relentless in telling you something has happened, but the language is so dry and empty that it doesn’t ever make you care. It’s a bit like running across the country with only a bag of Weetabix to keep you going, and no milk; plenty of things will happen, but you won’t enjoy any them. Peter Kay, The Sound of Laughter – exactly as funny and self deprecating as you’d expect Peter Kay’s autobiography to be. A few weird quirks (“…that was a joke.”) that don’t seem to translate well to paper, but mostly good fun. Dave Gorman, America Unchained – even funnier and even more self deprecating, Dave Gorman tries to cross the states without using any of the big franchises. I’d like to watch the documentary he was making during this. Robert Harris, Pompeii – an utter waste of words. Neither entertaining nor interesting. I think I’m done with Robert Harris now. Dr Nick Edwards, In Stitches – the book of the blog, bought to you by the Friday Project (remember that?). Frankly, Blood Sweat and Tea is much better. This one is repetitious, the rants are mainly moans and the touching moments are few and far between. H. G. Wells, The Food of the Gods – I’d forgotten how witty Wells can be. This is a really funny one. More social satire than sci-fi, and hilarious throughout. H. G. Wells, In the Days of the Comet – hmm. Not his best. – A loan from Nick, and I thank him for it. It’s perhaps the most original and playfully delivered book I’ve ever read, despite a few flabby areas. You’d enjoy it. Apparently, Film 4 have the film rights, and I hope they do a decent job of the adaptation. I hope they do it soon too, and that Steven Hall writes a great many books as excellent as this one. Harold Pinter, The Dwarves – this is early Pinter, and about as full of non-sequiturs and strangeness as you’d expect. It strikes me that Harold Pinter would have been great on Twitter. Charlie Brooker, Dawn of the Dumb – lots of Guardian Screen Burn pieces. I love Charlie Brooker greatly, and this made me chuckle out loud a few times. Geraint Anderson, Cityboy – he wrote a column for thelondonpaper and now the guts of it are available in paper form. Again. On smaller pages and you pay for them. I mostly picked this up as a partner to ‘Kill Your Friends’. Of the two, this is much more enjoyable. John Niven, Kill Your Friends – horrible, horrible book. Imagine ‘American Psycho’ set in the British record industry in the 90s, but with less imagination and wit. Horrible. 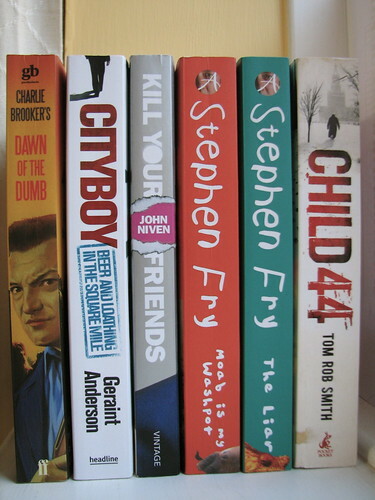 Stephen Fry, Moab is my Washpot – Stephen Fry’s brilliant autobiography, covering his life at school up to his 18th birthday. It was released after ‘The Liar’, but I read it first and I’m glad I did. Stephen Fry, The Liar – semi-autobiographical novel which (especially having just put down his autobiography) turns out to match his actual school life quite closely indeed. Quite brilliantly funny too. Tom Rob Smith, Child 44 – On the one hand, Tom Rob Smith has too many first names and is younger than me. On the other hand, it’s quite a good read, if suffering from a bit of a format plot. Robert Harris could have written it, if you know what I mean. That said, it’s as deserving of bestseller status as anything you’ll find in an airport this year. 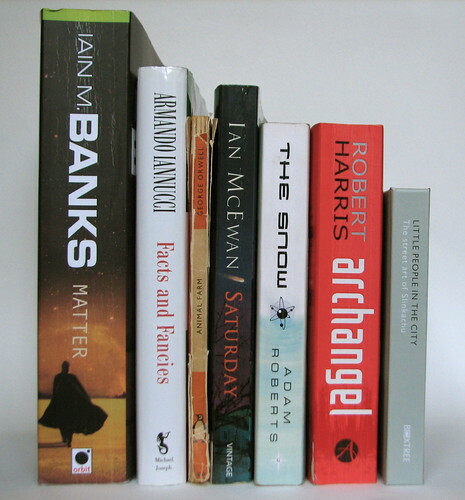 Iain M Banks, Matter – oooh, a new Culture book. It’s quite good, too. Armando Iannucci, Facts and Fancies – chucklesome but bitty. Slightly inconsistent, but worth it for some moments of Armando Iannucci at his insightful, cutting and random best. George Orwell, Animal Farm – I studied this at school, and re-reading it was a good experience. Orwell doesn’t mess around here, he has a point to make and he makes it relentlessly. Ian McEwan, Saturday – 24 hours, covered with a fine-toothed comb, as if Jack Bauer were a neurosurgeon living in . McEwan continues to be my favourite author at the moment. Adam Roberts, The Snow – meh. Glad I only paid 50p for this. I’ve read worse SF (and I would actually like to read more by Roberts) but this really isn’t great. Robert Harris, Archangel – I think this is the first Robert Harris book I’ve read. Nearly gripping, but no masterpiece. Another 50p one. Slinkachu, Little People in the City – yay! Now we’re talking. It’s little-people.blogspot.com in glorious paper form. 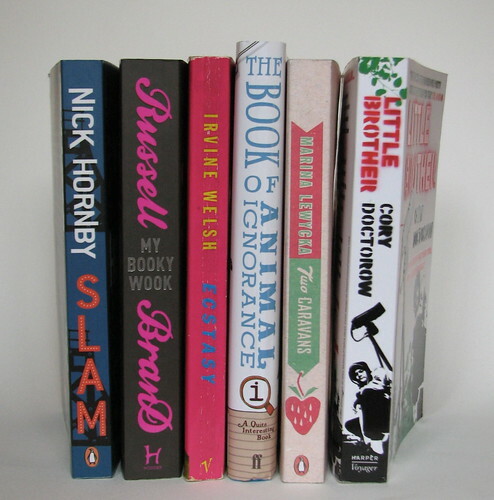 Nick Hornby, Slam – either I’m getting older and older, or Hornby is writing for a younger and younger reader. Still enjoyable though. 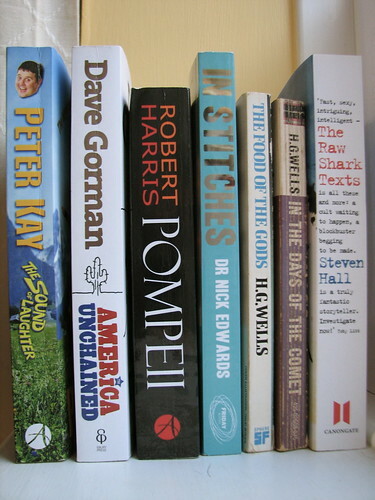 Russell Brand, My Booky Wook – I don’t read many autobiographies. I fully expected to hate this (even just based on the title) but having read and enjoyed it, I now like Russell Brand quite a lot more than I did before. Irvine Welsh, Ecstasy: Three Tales of Chemical Romance – a handful of short stories. Some of the most bland and forgettable of Welsh’s stuff. X, QI: The Book of Animal Ignorance – did you know that female kangaroos have three wombs and three vaginas? You would if you’d read this book, or sat still near me for several days after I’d read it. Marina Lewycka, Two Caravans – charming, poignant and thoughtful book about migrant workers and an adorable dog. Cory Doctorow, Little Brother – please read this. Here, you can even download it from the author’s website. Enjoy. Louis Theroux, The Call of the Weird: Travels in American Subcultures – Theroux’s guileless voice works as well here as in his documentaries. Alice Sebold, The Lovely Bones – beautifully moving. Incidentally, it seems Peter Jackson is turning it into film. I think I’ll have to see that. Hunter S. Thompson, Fear and Loathing in Las Vegas – as always, Thompson is viscerally funny. William Burroughs, Naked Lunch – not so much viscerally funny as viscerally ugly. Hard to stomach, at times. Burroughs dares you to enjoy it. 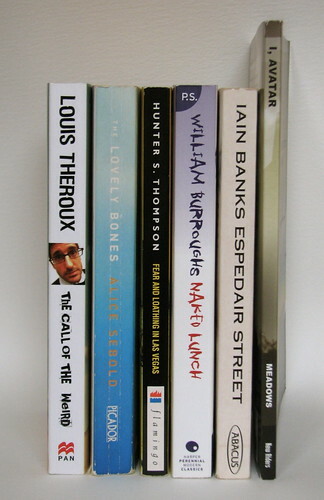 Iain Banks, Espedair Street – charming, inventive and slightly wistful exploration of a grown up rock star. Mark Stephen Meadows, I, Avatar – Mark was kind enough to send me his new book a few months ago. Well laid out and beautiful whilst also being informative and thought provoking. Still don’t ‘get’ virtual worlds? Read this. Mark Haddon, A Spot of Bother – a beautiful and wonderful story. Fiction for men always makes me happy. Hornby does it well, but I prefer Haddon. He also wrote The Curious Incident of the Dog in the Night-time, which I really enjoyed on holiday recently. James Bradley, The Resurrectionist – I wanted to like this. I enjoyed the writing, but it just didn’t work as a book. I think it was missing something. A story? Yes. I think it lacked a story. Nice writing though. Almost worth it for the quality of the writing alone. But not quite. David Simon, Homicide: a year on the killing streets – the creator of The Wire. It’s like a It’s like a weighty dead-tree version of that show, but focusing entirely on the police department. I really want to read ‘The Corner’ too (paperback coming April 2009, according to the inside cover of this book) which I believe will look in more depth at gang life. I’m still half-way through ‘Homicide’, but I love it. I’m torn between wishing it wasn’t so heavy, and wanting it to never end. Makes me want to re-watch The Wire from the beginning. Again. Hunter S Thompson, The Rum Diary – Imagine the great jonzo journalist, pre-gonzo but already deeply into rum, working in Puerto Rico at the tender age of 22. Wow. It’s great. Some of the paranoia and craziness you’d expect from later Thomspon is already showing through in this early book. 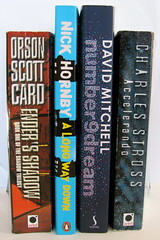 Orson Scott Card, Ender’s Shadow – a parallel story to Ender’s Game, following the background of the ‘Bean’ character. A tiny bit smug and pleased with itself in places (hello, Orson Scott Card) but a lovable book anyway. Nick Hornby, A Long Way Down – I enjoyed the characters (though, as often happens with Hornby, I was less convinced by his women). A funny and touching book about suicide. David Mitchell, number9dream – thanks to Nick for lending me this beautiful book. It’s David Mitchell’s second (I still have not read his first: ‘Ghostwritten’) and it is really rather good indeed. Accelerando, Charles Stross – starts with a near-singularity future, in which what I’ve been thinking of since my Palm III as a ‘peripheral brain’ is made real, and a cash economy is optional. Then goes further and further out into the future, in which AR, AI, and lobsters play increasingly important roles. The plot is a mess, but so full of fun ideas that I didn’t mind in the least. Since starting my new job, I’ve had a fair bit of time to read on the train, and at stations while waiting for trains. I notice I’ve been avoiding anything too arduous in the past couple of weeks, and most of this list is me re-reading some of the kid-lit I enjoyed as a teenager. 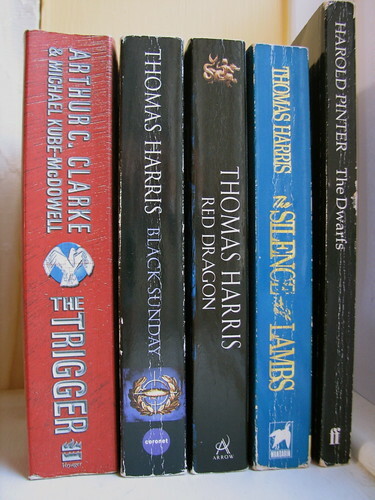 Terry Pratchett and Neil Gaiman, Good Omens – Pratchett is, IMHO, at his best when he writes with other authors (The Science of Discworld series, for instance). This is a good read. One of the best of this bunch actually. Worth picking up if you’ve somehow missed it. Richard Williams, Churnmore – I added this to my wishlist after reading a review at Noisy Decent Graphics last year. It’s great. Very funny, cutting satire aimed at creative agencies. I’m sure I’ve been in some meetings it describes. Robert Rankin, They Came and Ate Us – part two of the ‘Armageddon: the Musical’ trilogy. It’s been a long time since I’ve read any Robert Rankin. Silly, silly stuff, but with some very good moments. I especially like the bits in the centre of the earth, with Byron. Robert Rankin, The Suburban Book of the Dead – the third part of the trilogy, and not not as good as the second. I probably shouldn’t have read them back-to-back, because his style began to grate and drag more than a little bit. 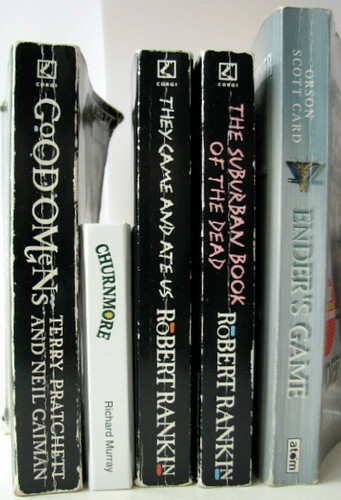 Orson Scott Card, Ender’s Game – I’ve read all (?) of Orson Scott Card and this is still my favourite. I immediately started re-reading Ender’s Shadow too, which will be my travel reading while flying to LA tomorrow.